Point Dume Marine Science Elementary School in Malibu, California, has received numerous accolades for its environmental advocacy programs, including the Environmental Sustainability Award from state Sen. Fran Pavley and the California Business for Excellent Education Award in 2006 through 2010. Now an education program officer at the Bill and Melinda Gates Foundation, Chi Kim was principal of Point Dume for nine years. 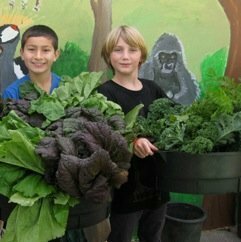 Here, she describes how Nourish helps Point Dume students connect their school garden to their food choices. Our marine and environmental science programs were flourishing, and with the addition of 33 solar panels, the school became a model of living what we teach. The challenge was to build on what we had already created, and the natural balance for our school was to go from taking care of our oceans and our climate to taking care of ourselves. It was also important to balance out the incredible amount of high-tech devices our students use daily. We became the ultimate environmentalists: we began to garden. Our Teaching Garden started in June of 2009. Students planted our organic garden before leaving for the summer, and when they returned, the garden had flourished. 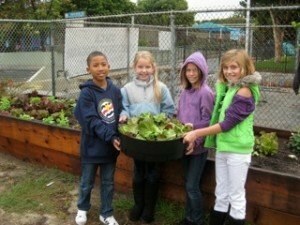 Staff and volunteers worked with students to plant, harvest, and cook throughout that school year. Our pilot year was good and the harvest fresh. Although they enjoyed the lessons and activities, our students were still not fully aware of why organic gardening was important. When I was gifted Nourish, we began using the curriculum. The students really began to make the connection. The images on the clips coupled with thought- and conversation-provoking questions led to deeper understanding of the importance of knowing where our food comes from before we make the choice to consume it. “You have to feed yourself the good foods so that you can stay alert and healthy”. Nourish is powerful. Its simplicity and thoughtful message will have a lasting impact on our students.